BASSETERRE, St. Kitts, November 30, 2018 (Press Unit in the Office of the Prime Minister) – Proprietor of the Grange Healthcare Facility in Ottley’s Village, Mrs. Patricia Richards-Leader, M.B.E., has again voiced her appreciation for the dedicated support and service rendered by Prime Minister Dr. the Honourable Timothy Harris over the years which have led to the advancement of the healthcare facility and improved comfort for residents, staff and visitors. “Prime Minister Harris really has been a great supporter of the Grange since its inception. Not only are we in his constituency [St. Christopher Seven], but I think that we, in some way, share a birthplace and as a result he has been quite supportive,” said Mrs. Richards-Leader who was born in Tabernacle. “One of the best things he has done for us was to give us this wonderful road to the Grange. He kept his promise, for he did, as part of his election pledge, say that he would actually give us this road,” Mrs. Richards-Leader said on Thursday (November 30), when Prime Minister Harris paid a visit to the staff and residents of the facility. Having a paved road constructed had long been a priority for the management of the nursing home. Mrs. Leader said that the pre-existing dirt road made vehicular access to the Grange Healthcare Facility for staff, family members and emergency services extremely difficult for the first 16 years of the facility’s operation. The conditions worsened particularly during times of heavy rains and hurricanes. In 2016, the paving of the road to the Grange rectified this challenge. During his visit, Prime Minister Harris, the Parliamentary Representative for Belle Vue to Ottley’s, commended Mrs. Leader for her patriotism and passion for nursing that led to the establishment of the Grange Healthcare Facility. “Before the Grange came, there was no appropriate facility for those who wanted an alternative to nursing care. Patricia Kingori Leader came to St. Kitts and asked not what the country or the Government can do for her, but importantly, what she could have done. Her love of nursing led her to want to care for the elderly and she invested all that she could have and more into this facility,” Dr. Harris said, noting that he was delighted to have been there from the inception 18 years ago and to now be able to see the transformation of the facility today. 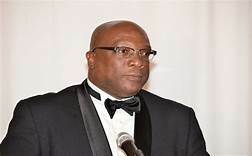 Dr. the Honourable Timothy Harris is this month celebrating 25 years of service to the people as the Member of Parliament for Constituency #7. As part of his visit to the facility and in observation of his significant 25^th anniversary milestone, the Honourable Prime Minister presented to Mrs. Leader a gift package of items that can be used during the day-to-day operations at the Grange. The Prime Minister was accompanied on his visit by Deputy Speaker in the National Assembly, Senator the Honourable Akilah Byron-Nisbett.